James and Joan Moryalti Western Investigators In Libya: The Libyan Security provided documents to Washington which revealed involvement of Morsi Former President of Egypt and Brotherhood Organization for the assassination of ” Chris Stevens US Ambassador in Libya on 11/9/2012. Barack Obama financed Brotherhood terrorist activities in Egypt. James and Joan Moryalti were interviewed on “Voice Of Russia” Radio station and they are Western Investigators who stayed in Libya during the NATO invasion. They are a part of a non-governmental organizations. They are observers and informers of war crimes in Libya. 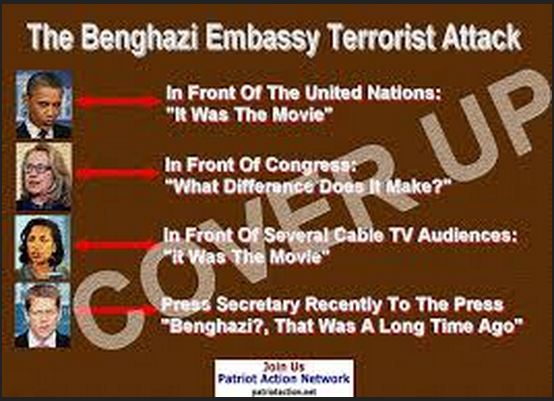 They worked on a 100 days mission in Libya with the Libyan Tribes to find out the truth. The Western Investigators revealed some facts to Voice of Russia Radio Station about the involvement of Brotherhood Organization in Egypt and Former President Morsi for the assassination of Chris Stevens US Ambassador in Libya. They confirmed that Al-Qaeda Organization owns Libya now. They mentioned that the only way to save Libya from Extremists and Terrorists is through the Libyan Tribes who do not support The Islamist Extremists. Through their observations, Joan and James confirmed that the Muslim Brotherhood Organization practiced crimes in Libya and Egypt and these crimes were financed by Obama’s Administration. 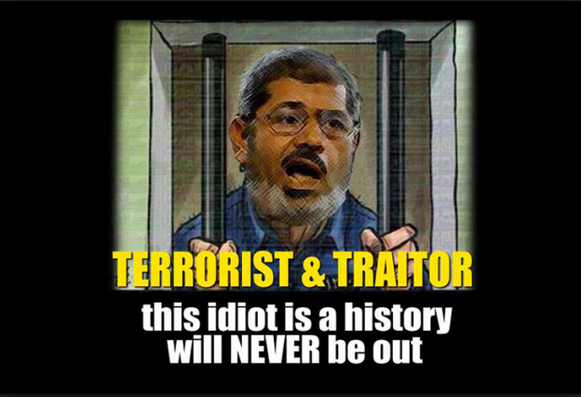 Mohamed Morsi Former President of Egypt is involved in planning the assassination of the US Ambassador. James explained that Al-Qaeda Organization and their Branches like Ansar Al-Sharia Group, literally own Libya. The United States is trying to keep away these terrorist Groups to retrieve the US Surface-to- Air Rockets. 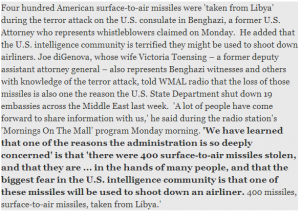 There are hundreds of these Rockets which were stolen from US compounds by the Muslim Brotherhood and Al-Qaeda in Libya during the attack on the US Embassy in Benghazi. James added that this is a serious problem for the United States because these Rockets can be used in taking down friendly Aircraft, passengers Aircraft and everything all over the world. James mentioned that everybody knows this. The Presidents of Chad, Nigeria and Algeria warned the NATO and the USA that if these weapons left Libya, they would represent a real threat to the entire world. This needs to be stopped! (said James). Speaking about the weapons, Joan said that these weapons are in the hands of Al-Qaeda in Libya now. And they got information that some of these Rockets were moved through the borders with Chad and Nigeria and other borders. She also said these weapons called MANPADS or MPADS, and there are different names to these weapons. But the American Rockets are unique and have a featured mark. Anyone in the world would recognize that these are US Rockets if they see them. 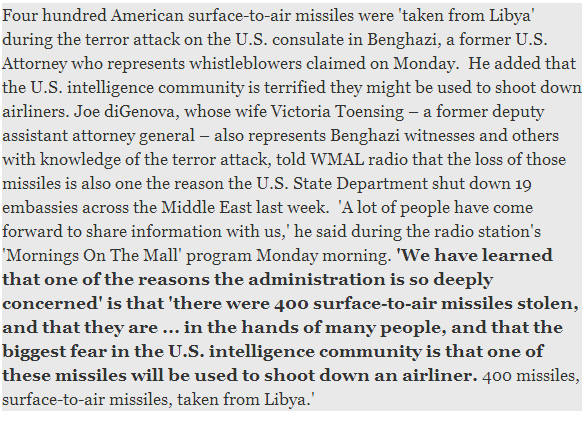 According to Joan, these Rockets went out from America to Qatar then to Libya and it was the same day of the assassination of Chris Stevens the US Ambassador in Libya. Joan indicated that all Islamic organizations in Libya belong to Al-Qaeda. They use different names to confuse the West . These are the Islamist groups which were hired by the NATO to overthrow Gaddafi. These same Islamist Groups were also hired and planted in Syria to overthrow the Syrian Regime. 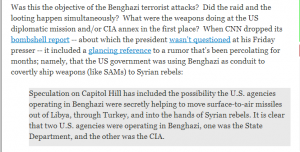 According to James, Chris Stevens had an essential role in sending weapons to Extremists in Syria with the help of Abdul Hakim Belhag (The commander of the military wing of the Libyan revolution in Tripoli). 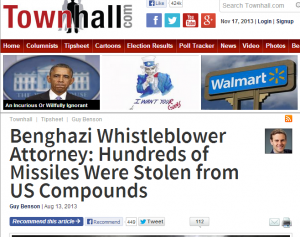 What were the weapons doing at the US diplomatic mission? 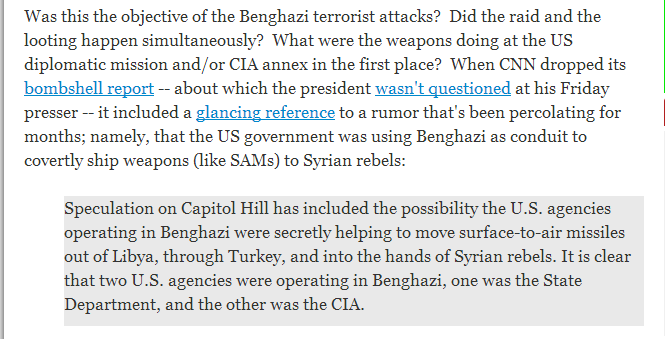 The US was using Benghazi as conduit to covertly ship weapons to Syrian Terrorists. James spoke about one of the spies in the Libyan Tribes. This spy works for a Libyan Organization. James managed to get information from this spy who was serving diner to Chris Stevens and the Personal Representative of the Turkish Prime Minister, the night Chris was assassinated. Stevens told the Turkish Representative that Turkey can use their influence in assisting the US to retrieve these Rockets. But the Turkish Representative told Chris that they are not going to assist the Americans in this regard. 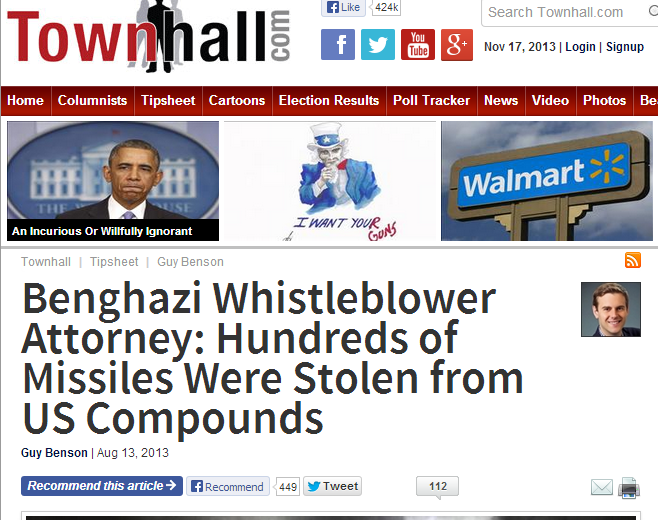 James said that he informed the CIA of this piece of information but they didn’t react to it. James said that Erdogan the Prime Minister of Turkey is a Muslim Brotherhood and this is not a secret, everybody knows this. Erdogan thinks that one day in the future he will become a Caliph (Leader of an Islamic state led by a supreme religious). Erdogan is an Islamist Extremist and he has the authority and the power. James also indicated that Al-Qaeda own Libya now and they do not take orders from anyone. Now, Al-Qaeda have money and finances and they are on their way to do whatever they want in the entire world. Joan talked about the Libyan intelligence report that was published on 26/6/2013 by several Arabic websites, including Veto Gate. 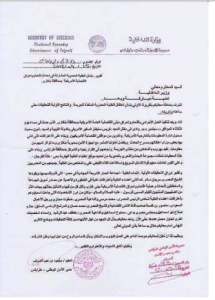 The report was issued on 15/9/2012 and addressed by Mahmoud Ibrahim Sharif, Director of National Security of Libya to the Libyan Minister of Interior. The report revealed an Egyptian Terrorist cell which was involved in the consulate attack. Based on confessions from some of the elements arrested at the scene “six people”, and as the report confirmed that all of them were Egyptians from the Jihad group Ansar al-Sharia (Supporters of Islamic Law), and they got arrested. According to the report, during the interrogations of these Egyptian Jihadi cell, they confessed that the financial sources of their group and the planners of the event and the storming and burning of the US consulate in Benghazi are Former Egyptian President Mohamed Morsi; preacher Safwat Hegazi (Muslim Brotherhood); Saudi businessman Mansour Kadasa, owner of the satellite station, Al-Nas Channel; Egyptian Sheikh Muhammad Hassan; Former presidential candidate, Hazim Salah Abu Ismail. 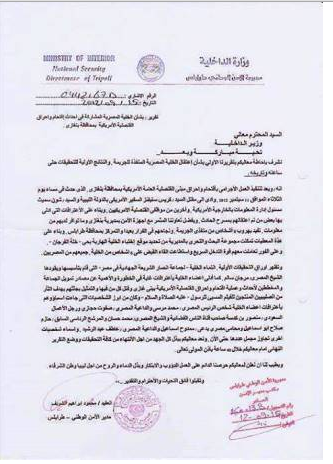 Joan added that she got a document from the Libyan Authority in relation to the involvement of Muslim Brotherhood concerning the assassination of US Ambassador and that document has been read in the US Congress and it is a part of the Congress records in the USA. Furthermore, Joan confirmed that Former President of Egypt, Mohamed Morsi is the planner and the financier of the whole attack that stormed the US Embassy and assassinated the US Ambassador in Libya. According to Joan, the attack on the US Embassy was very organized and she told the Voice of Russia Radio Station that the US Ambassador was under a big pressure from the Obama’s administration to get the US Rockets back. Obama’s administration have put the responsibility of getting back the weapons on Stevens shoulders and he really didn’t have any chance to get back these weapons. The US Ambassador was actually calling and asking these terrorists Groups to deliver these weapons. Joan was questioning why the US Administration did not send any backup or additional support to protect the US Ambassador, knowing that he was surrounding by dangers! Joan also mentioned that Obama deals with Muslim Brotherhood and he supports them. 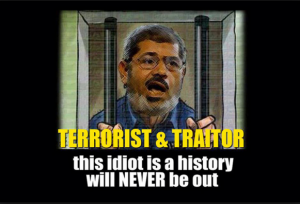 When you have eyewitnesses on Crimes committed by the Muslim Brotherhood, it makes things easier for you to make these eyewitnesses vanish, because then it will be very hard and difficult to prove anything that took place earlier. The Voice of Russia Radio Station asked Joan whether it is possible or not that Obama’s administration gave a direct order to get rid of Stevens because he knew a lot of details in relation to US suspicious dealings? Joan’s answer was Yes it is possible because she and James were eyewitnesses and observers in Libya since the Nato’s invasion. She confirmed that There were many Illegal activities which took place in the Nato’s invasion and war against Libya. Once you are an eyewitness on their crimes, you become a danger and a threat. 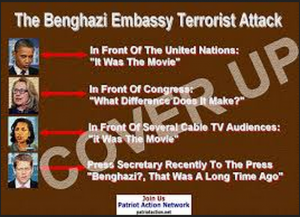 No one interfered or did anything to protect the US Ambassador. Joan also mentioned that for this reason, Obama escalated his support to Morsi Former President and the Muslim Brotherhood Regime, because the US administration want the Muslim Brotherhood to participate in the Egyptian Government and this is what they are pushing for right now. Joan confirmed that the US have the proof that Morsi and the Muslim Brotherhood are behind the assassination of Chris Stevens the US Ambassador. Obama’s administration received 3 days after the assassination of Stevens, an official document report issued by the Libyan National Security which proves that Morsi and the Muslim Brotherhood planed for the assassination of the US Ambassador. The Libyan security arrested the terrorists elements who executed the storming of the US Embassy after 3 days from the terror attack. The Killers confessed that they got hired by Muslim Brotherhood in Egypt to assassinate the Ambassador. 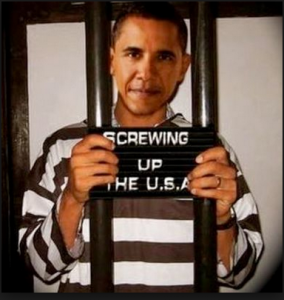 Obama is still lying about the real reason of the assassination of Stevens, and he is still insisting that the terror attack took place due to the Film Abuser to Islam. Joan added that this movie issue is an artificial reason, because Obama is totally ignoring all facts and evidences which were provided in this issue and also to cover up on other suspicious activities. Joan also said that the crimes of Muslim Brotherhood in Egypt are countless. She said that they managed to get a copy from the document which proves that Brotherhood took money and finances from a foreign country which is over 850000,00 USD and this is a treason to their own country. Brotherhood are in Jails and they are facing trials of treason, espionage and terror acts. The punishment of these charges can reach condemning to death. This is the first step, said Joan. Because the Brotherhood trials in Egypt will lead to the second step of Obama’s trial in the International Criminal Court. Because Obama’s administration financed Muslim Brotherhood in Egypt and they are a terrorist Organisation. Brotherhood used these money in terrorizing Egyptians, brutally attacked them, hired and paid thugs and killers to terrorize Egyptians. They also attacked Churches and burned them, and they killed Christians and terrorized them. Joan added that all these terror activities of the Muslim Brotherhood in Egypt, were financed by Obama’s Administration through the US Embassy in Cairo. The Muslim Brotherhood and Al-Qaeda in Libya have the Libyan Oil and in addition to the oil, they have their own State in Libya now. Both Muslim Brotherhood and Al-Qaeda in Libya are capable of practicing their activities in the whole entire world. Joan ended her interview with Voice of Russia Radio Station by saying that the best thing to do in Libya in order to get rid of Al-Qaeda and Muslim Brotherhood Terrorist Organizations, is through the Libyan People and the Libyan Tribes who reject these terrorists Organizations and they absolutely don’t support them in Libya. Source of the Article: Albawaba News, report published in Arabic Language on 13/11/2013.